Koror, Palau – March, 2013. Last 11th of March, Prince Albert of Monaco and his wife, Princess Charlene, came to visit Palau as part of their Pacific Tour. Etpison Museum, with NECO Marine dive shop as one of the local sponsors, runs an education program called “Palau Dugong Awareness campaign” with main goal to educate Palauans about the dugong, Palau’s most endangered marine species, survey their feeding grounds and daily routes, and work with local government agencies to improve enforcement on illegal poaching. Indeed, Palauans still hunt and eat dugongs, and poaching remains a problem despite of local laws protecting the dugong. One of the activities undertaken in 2011 was the publication and distribution to local schools, libraries, and government agencies of an educational booklet about these endangered mammals. In 2013, with founds from the Principality of Monaco though the United Nations Environmental Programme, a new kids booklet as well as posters were published for all 7th and 8th graders in Palau. The distribution of those booklets to local schools coincided with the visit of Prince Albert of Monaco and his wife, Princess Charlene, to Palau. 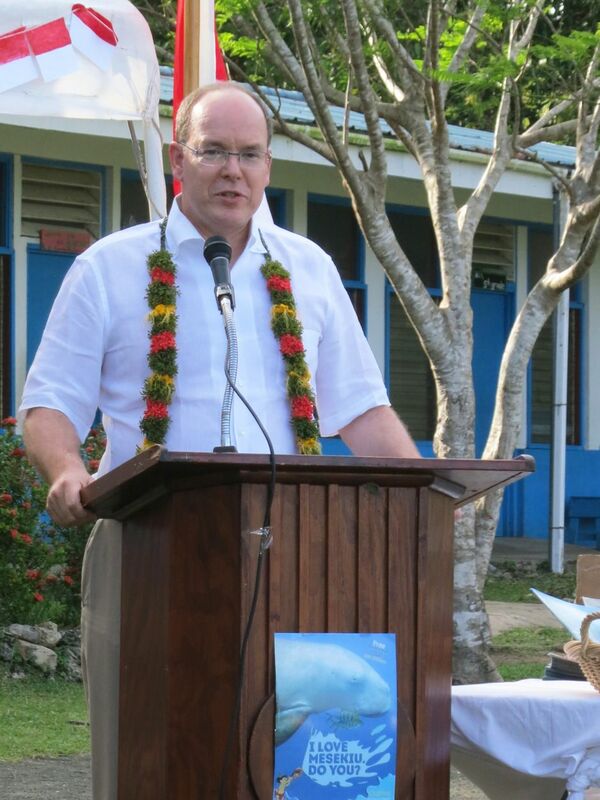 Prince Albert, known for his conservation efforts and donations, handed out those booklets to the kids and made a speech announcing the importance of protecting this rare marine mammals, especially in Palau where there is a very small and isolated dugong population, with possibly only a few hundreds animals.